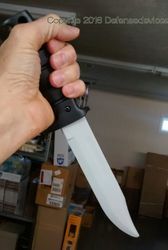 Soft plastic knife for realistic training drills without danger of injury. 11 and5/8 inches overall length.Blade portion is 6 and 5/8 inches long. Weighs 2.8 oz.